Witnessed on the Kill Van Kull. Back in April, your Newtown Pentacle displayed shots of and discussed the estimable USS Slater’s arrival at the Caddell Dry Dock on the Staten Island side of the Kill Van Kull. 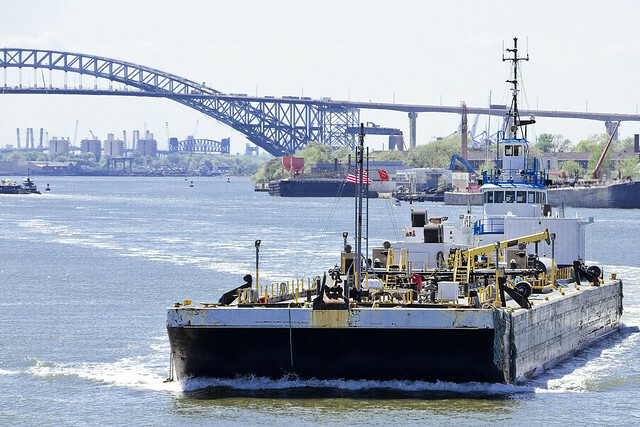 Your humble narrator was onboard the recent Working Harbor Newark Bay excursion when the Slater was encountered again. 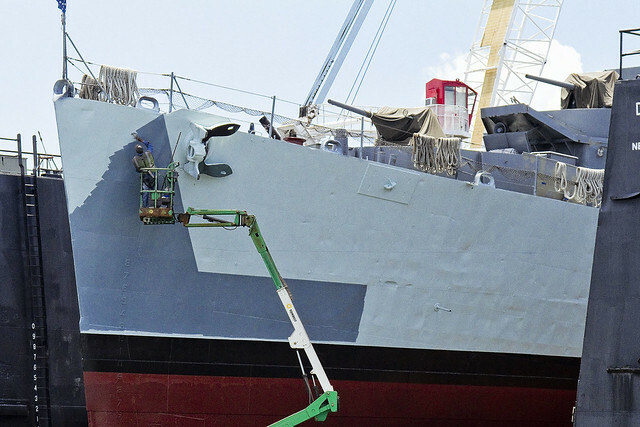 From the look of it, the ship was being repainted by one guy, which is a ridiculous notion. 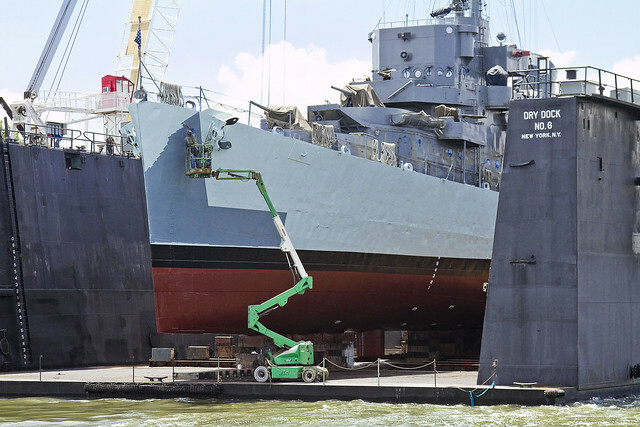 You can’t paint a Navy Destroyer, retired or not, with just one brush. I’d insist on using a roller, at least. My understanding is that Slater will have returned to the water by the time you’re reading this, although I’m unsure of when her vacation in the City will be over and she returns to duty in Albany. 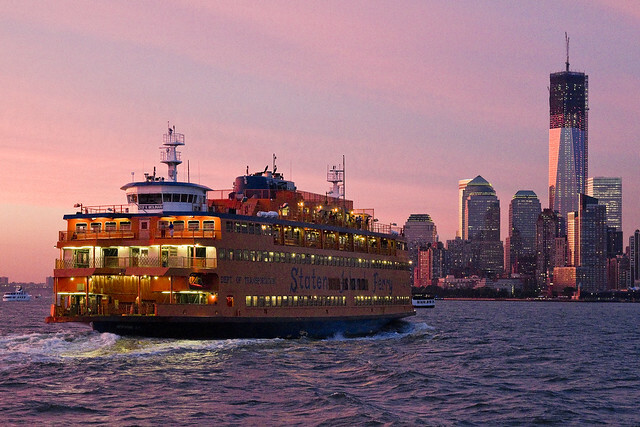 One cannot imagine how expensive her trip to the spa has been, but Staten Island is noted for its rejuvenating qualities, so it’s probably money well spent. 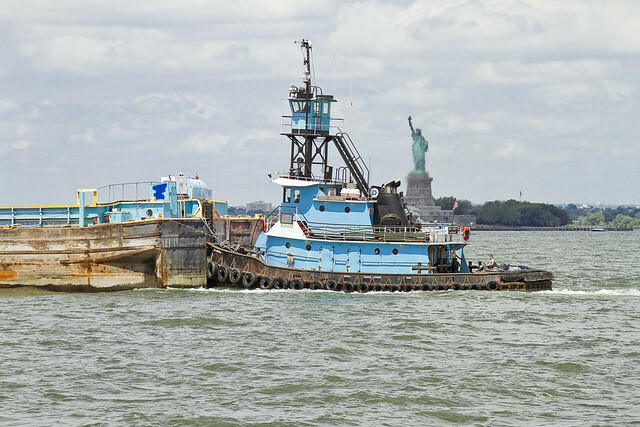 Paul Andrew, a tug operated by the DonJon towing concern (which has also been mentioned before at this, your Newtown Pentacle), slid past the Statue of Liberty, which was a shot I couldn’t resist capturing or presenting here – at your Newtown Pentacle. For this Maritime Sunday, check out the show (visible from the infinities of Brooklyn) which was playing out on the East River last Friday. What you’re seeing are two Moran Tugs- The Doris Moran and the James Turecamo- towing a floating dry dock past midtown. The Caddell company’s gargantuan… dare I say cyclopean… equipment is an amazing maritime structure. 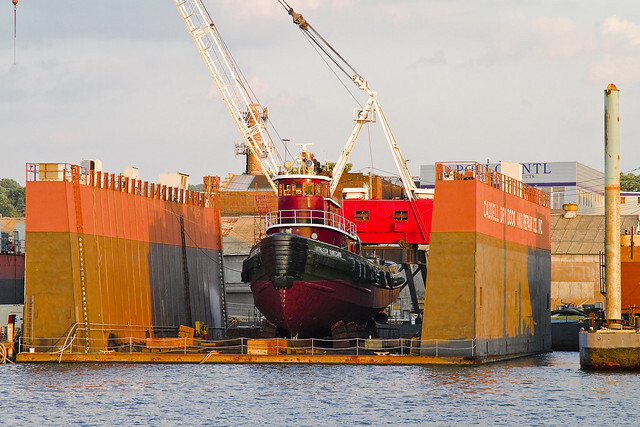 A floating dry dock will submerge itself, whereupon a boat will be floated into position over it, and the structure will rise up and capture the vessel. 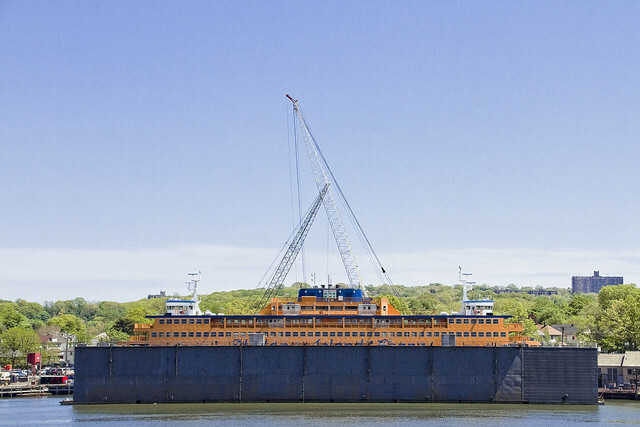 The dry dock will fully resurface and lift the ship into the air, allowing repairs and maintenance to be performed. Here’s a shot of a tug undergoing repair on another one of Cadell’s drydocks at the Kill Van Kull. 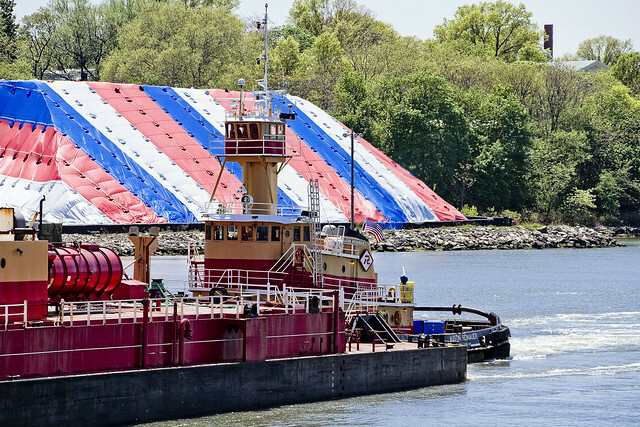 Maritime Sunday is here once again, and this time around your Newtown Pentacle is focusing in on something most New Yorkers wouldn’t believe exists within the five boroughs- graving or dry docks. These shots are of the Cadell yard, along the Staten Island border formed by the Kill Van Kull. 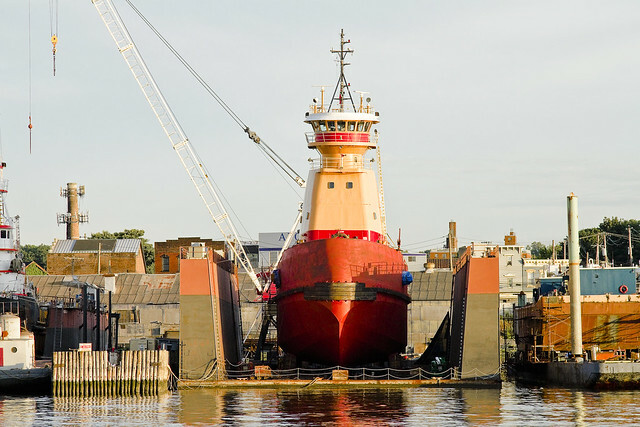 A floating drydock is a type of pontoon for dry docking ships, possessing floodable buoyancy chambers and a “U” shaped cross-section. The walls are used to give the drydock stability when the floor or deck is below the surface of the water. 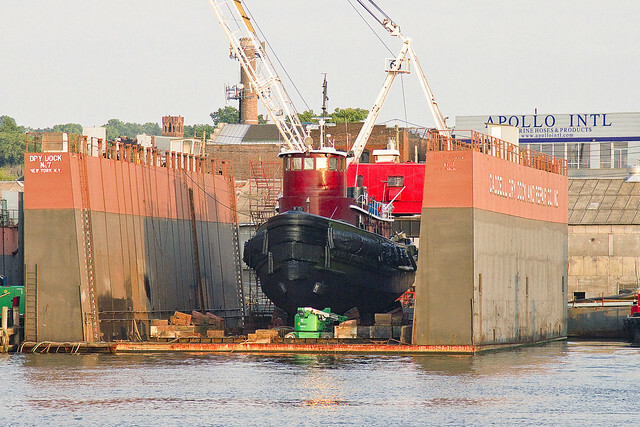 When valves are opened, the chambers fill with water, causing the drydock to float lower in the water. The deck becomes submerged and this allows a ship to be moved into position inside. 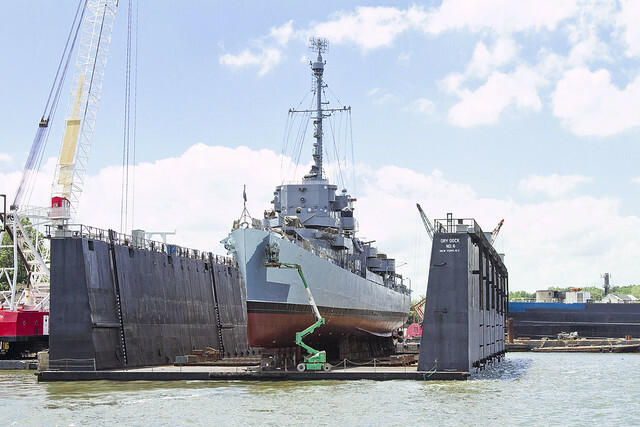 When the water is pumped out of the chambers, the drydock rises and the ship is lifted out of the water on the rising deck, allowing work to proceed on the ship’s hull. Tugs, in particular, take a lot of abuse. Towing hundreds of millions of tons through choppy waters puts terrific strain on their hull and superstructure. Just like the family car, they occasionally need to head for a garage to be inspected and repaired- or just painted to avoid the corruption of oxidation. 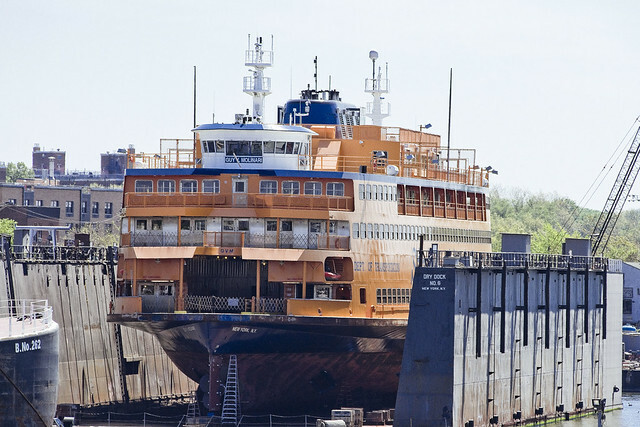 CADDELL DRY DOCK AND REPAIR CO., INC (Caddell) accommodates a wide variety of marine vessels on its floating dry docks and piers. 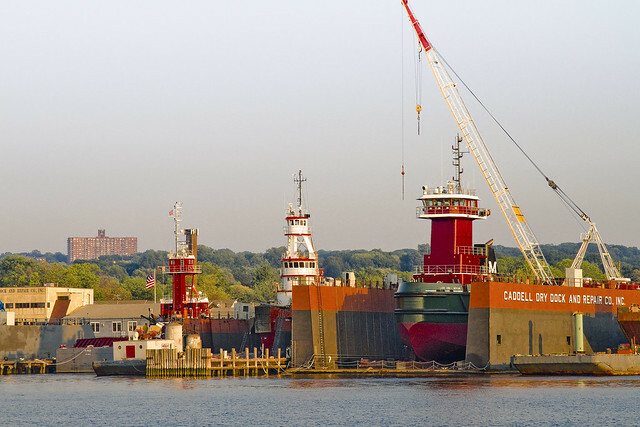 The Caddell facility is one of the largest full service shipyards in the New York Metropolitan Area. 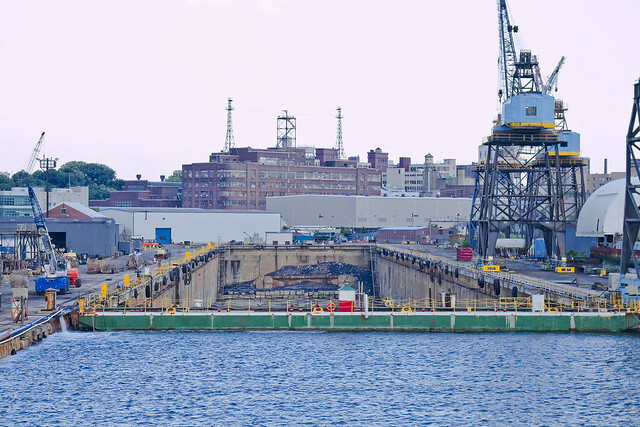 In addition to our dry docking services, we offer pier side repair work available on our network of eight piers with crane operations able to extend up to 200′ and capable handling loads up to 6500 tons. 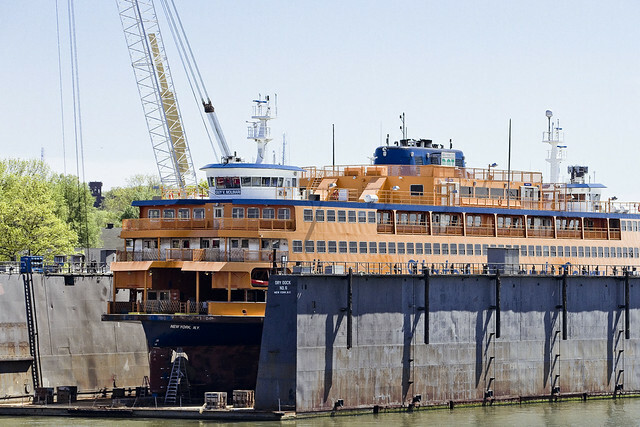 Caddell has carried on the noble maritime tradition and legacy of a uniquely exceptional shipyard by providing quality and prompt service at competitive prices for the surounding New York City region for more than a century. Like a lot of heavy industries, the graving docks have largely left New York City. Large facilities at Atlantic Basin in Red Hook and other places have simply been left to rot away. The ones in Staten Island seem to be hanging on, doing essential work that keeps the harbor moving. Building and repairing boats and ships was Staten Island’s most important industry before the First World War. One of the Island’s earliest and most important shipyards belonged to William and James M. Rutan. Their shipyard produced about a 100 schooners and sloops per year. There were 17 shipyards on Staten Island by 1880, located on the North Shore, in Stapleton and in Tottenville. Tugs, propeller yachts and coal barges were built there. US Navy and international shipping in the late 1800s produced a need for large shipyards. They could be found along the Kill van Kull near Mariners Harbor and Port Richmond. In 1901-1902, Townsend and Downey Shipyard built the Meteor III, an imperial yacht for Kaiser Wilhelm. By the 1920s, 18 shipyards employed 6,800 people. This is from the Brooklyn Navy Yard, and shows the other sort of drydock, a granite pit outfitted with sea walls and gargantuan pumping mechanisms that can accommodate all but the very largest shipping. On the eve of World War II, the yard contained more than five miles (8 km) of paved streets, four drydocks ranging in length from 326 to 700 feet (99 to 213 meters), two steel shipways, and six pontoons and cylindrical floats for salvage work, barracks for marines, a power plant, a large radio station, and a railroad spur, as well as the expected foundries, machine shops, and warehouses. In 1937 the battleship North Carolina was laid down. In 1938, the yard employed about ten thousand men, of whom one-third were Works Progress Administration (WPA) workers. The battleship Iowa was completed in 1942 followed by the Missouri which became the site of the Surrender of Japan 2 September 1945. On 12 January 1953, test operations began on Antietam, which emerged in December 1952 from the yard as America’s first angled-deck aircraft carrier. The US Navy took possession of PT 109 on 10 July 1942, and the boat was delivered to the Brooklyn Navy Yard for fitting. This boat was sunk in the Pacific in August 1943 and became famous years later when its young commander, Lt. John F. Kennedy, entered politics.